Ford SVT Raptor with... six doors?! 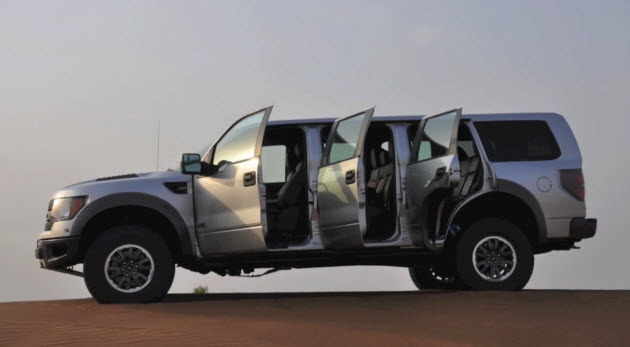 Only in the UAE - Ford F150 Forums - Ford F-Series Truck Community. The United Arab Emirates is a land that continually breathes new life into the phrase "More money than sense." The new prime example of this is a custom-built Ford SVT Raptor that believes the proper number of doors is six. Said to hail from the UAE, it's quite clear that anything goes in the Land Of The Burning Dollar Sign Sun. We're not going to completely hate on this thing, of course, as the idea of a six-door Raptor puts visions of a seriously great camping trip in mind. Still, we're not even sure if this thing is actually real or if someone with solid skills spent too much time playing around on their computer. Judge for yourself by clicking past the jump and watching the video. Kind of neat whether it's real or not. Add a few dog and some kids, and those extra doors will come in handy!